Engineering Wireless Services (EWS), based in Tempe, AZ, provides service and support to the cell tower/telecom industry. Their clients depend on EWS’s fast response time to fix tower issues 24 hours a day. Most tower work over 100’ is handled by tower climbers, but an increasing number of their clients utilize decorative or concealed towers under 100’ that cannot be climbed. 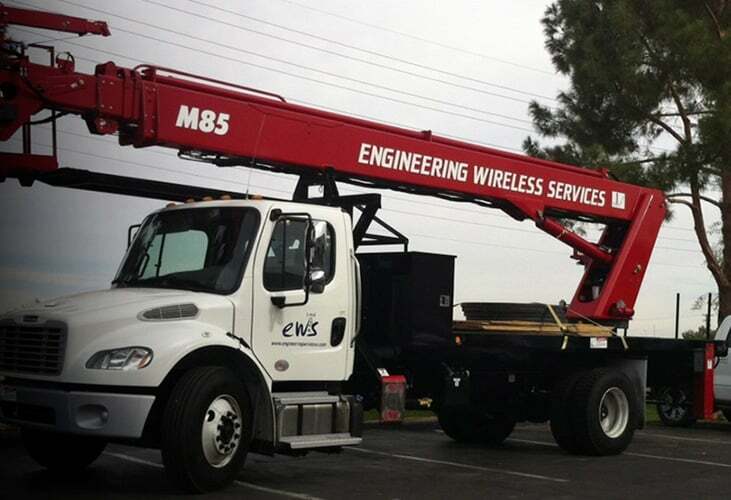 Handling this work requires an aerial device or manlift that can reach the top of the towers, and because EWS supports critical wireless network infrastructure in the telecommunications industry, deploying a dependable, well-built aerial equipment on service calls is extremely important. To respond to this need, EWS began doing exhaustive research to find an American-made truck-mounted aerial work platform with a telescopic boom and enough reach to handle the majority of the company’s low-height tower work. 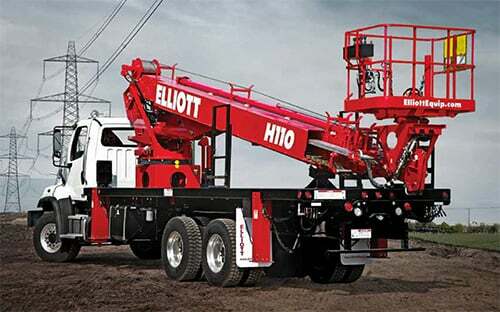 The search ended in 2013 when EWS came across the Elliott Equipment Company M85 HiReach aerial work platform. The M85 features a three-section boom with a working height of 87 feet and a side reach of 74 feet, giving EWS technicians easy access to many of the towers they service. Its oversized 30” x 54” platform can hold 750 pounds, easily supporting two technicians and their tools. The machine is built to last, with a full-length heavy-duty subframe and oversized rotation bearing and gearbox. Elliott HiReach models also feature DynaSmooth hard-wired controls in the work platform with engine speed and controller sensitivity switches. The controls are easy to use and provide smooth operation and superior accuracy. Some of the most important work Engineering Wireless Services performs is emergency repairs and on-call maintenance for telecommunications assets. Due to the frequent calls EWS receives from clients for these jobs, the company needed a versatile machine that was ready to respond at all hours, just like their technicians. Customers recognized the value the Elliott M85 HiReach added right away. With its own truck-mounted aerial work platform available around the clock, EWS could respond to calls for service more quickly than competitors that rely on renting self-propelled lift equipment on an as-needed basis. The value compounded when EWS became able to respond to service calls overnight when manlift rental companies were closed. Technicians can deploy the M85 HiReach at midnight and complete a repair before dawn, hours before competitors can arrive on scene. The Elliot Equipment Company M85 HiReach aerial work platform provides the ease of use, durability, versatility and range that EWS’ technicians need to perform important work when getting telecommunications assets back online quickly is of the essence. Engineering Wireless Services technicians can get to about 90 percent of the towers they service with their Elliott M85 HiReach, but there are a remaining few that are just out of reach. That’s why, when the time is right to expand the fleet, EWS says Elliott’s H110R HiReach is a leading candidate, offering the added working height technicians require to meet the needs of customers and keep their telecommunications network working night and day, no matter what. You can reach out to your nearest Elliott distributor or contact an Elliott representative to discuss which Elliott HiReach model is the best match for the work you do. You can also find additional information on all our HiReach models here. Ready to add a HiReach to your fleet? Request a free quote.